The Dallas Cowboys have reached an agreement to add veteran receiver Randall Cobb to their receiving corps for the 2019 season. The one-year deal, worth $5 million, comes after the team let longtime slot weapon Cole Beasley walk in free agency to join the Bills Mafia in Buffalo. The need for a proven slot receiver was massive for the Cowboys offense, as Beasley ran 87 percent of his routes from the slot over the past three seasons. Cobb is a logical fit and he’s more than capable of filling the void, as he’s run 81 percent of his routes from the slot over the last three seasons in Green Bay. After finishing up the four-year, $40 million contract he signed in the 2015 offseason, Cobb enters the upcoming season in Dallas on the heels of an injury-plagued 2018 campaign. This past season was the lowest-graded of his career (60.2) and it was also the fewest snaps he’s played in a season since 2013 (466). 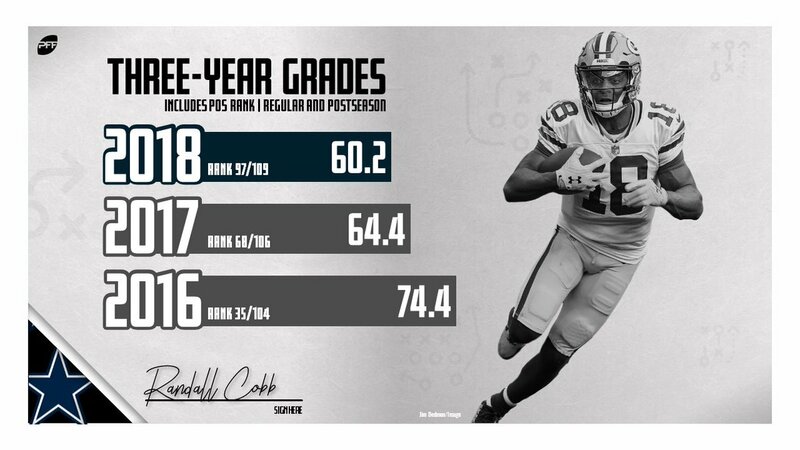 Peaking in 2014 (84.6 grade, 129.2 passer rating when targeted), Cobb has continually declined in overall grade and snaps played since, though when healthy, he is still capable of performances like we saw in Week 1 of the 2018 season against the Bears, where he hauled in nine catches for 142 yards and 152.1 passer rating when targeted. Although the injuries have been a major story of Cobb’s eight-year career, his addition could provide a significant boost for the Cowboys as a reliable option in third-down situations. Among 64 receivers with 50 or more targets on third down since 2016, Cobb ranks fourth by generating a 118.7 passer rating when targeted, while Beasley lists at 17th with a 107.8 rating. Further, the veteran playmaker has repeatedly proven his consistency with only one drop on 71 third-down targets and has moved the chains on 35 different occasions on third downs in that three-year span. His connection with Aaron Rodgers obviously didn’t hurt, as the Packers’ quarterback has produced a three-year 90.6 overall grade on third downs, which ranks fourth at the position. In contrast, Dak Prescott ranks 15th among quarterbacks with a 72.5 overall grade on third down since 2016. By joining the Dallas receiving unit, coupled with the void left by Beasley, Cobb instantly becomes another reliable option needed for Dak-and-company on the critical downs. Cobb’s fit and talent from the slot complements both Amari Cooper (106.2 – 12th among receivers) and Ezekiel Elliott (108.8 – seventh among running backs) by ranking in the top-25 among 85 offensive skill players in receiver rating on third downs throughout the last three seasons. He may not be the game-changer he once was, but the longtime Green Bay Packers receiver still offers value as a proven veteran in the NFL. His career-low overall grade in 2018 is cause for concern, for sure, but the change of scenery may be just what the doctor ordered when it comes to getting at least some of the old Cobb back in action.